My friend Shawn Magee knows all the best places to eat and drink in San Francisco. He owns Amnesia, a happening bar in the Mission known for its awesome selection of micro-brews and belgian beers. He seems to be best buds with everyone making delicious comestibles in the city. He’s a good person to know. Well, I felt a bit indignant on behalf of rum. I’ve sampled some spectacular rums that a non-rum-hating friend brought back from a trip to Central America and couldn’t believe how smooth and rich they tasted. White rum makes a great neutral addition to cocktails, while gold and dark rums can add sweetness and boozy complexity to baked goods. I like rum inpunch,mojitosanddark and stormies; inbanana upside-down cakesandbuttercrunch toffee. It adds boozy sweetness tocongo bars,scones, evencinnamon buns. Besides, pirates like rum, and pirates are cool, right? Unlike the aforementioned couple, though, rum and coconut do make a perfect match. 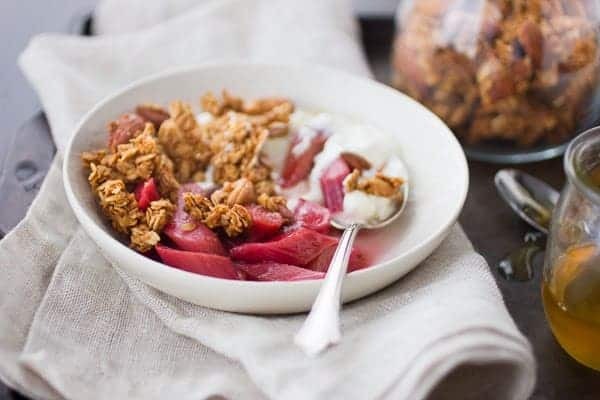 They also make this granola, my current favorite iteration ofmy favorite granola recipe,highly addictive.Coconut oil crisps the oats, which are sweetened with coconut sugar and maple syrup and studded with roasted whole almonds and cashews. Shredded coconut gives the granola a shattering crispness and dark rum and vanilla flavor the toasty oats. The alcohol bakes away in the heat of the oven, but it adds robust undertones that make the crunchy clusters habit-forming. 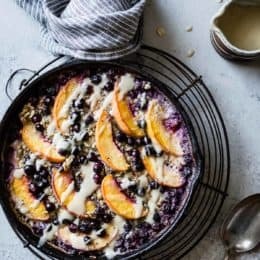 It’s full of earthy, friendly flavors that welcome a scoop of yogurt and any spring or summer fruits. The base recipe comes by way of my pastry teacher who got it from a past job at Moose’s. The baking technique is brilliant: the granola gets spread into an even layer and sandwiched between two baking sheets lined with parchment paper. It bakes into a golden sheet, no stirring necessary, which can then be broken into large clumps and clusters. 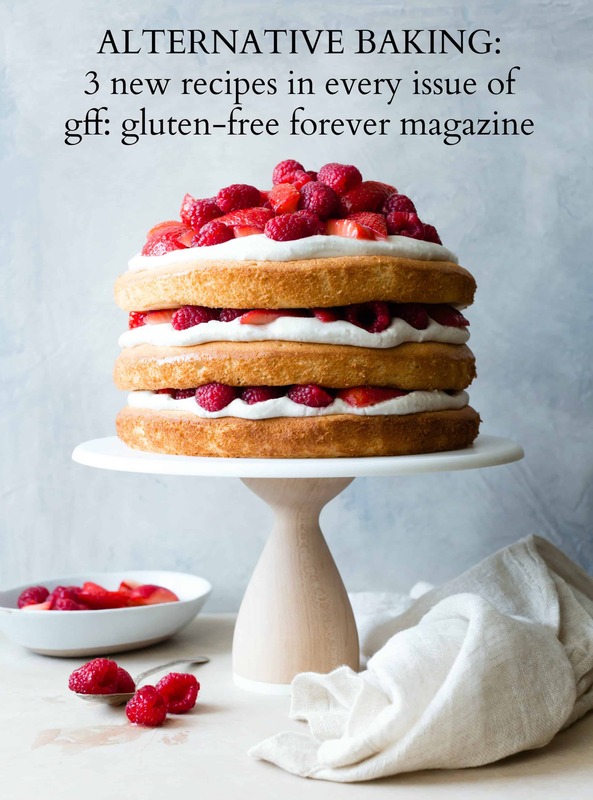 I’ve seen granola recipes call for flour or egg white to create the coveted clumps, but this method is easier and it allows the final product to be both gluten-free and vegan. 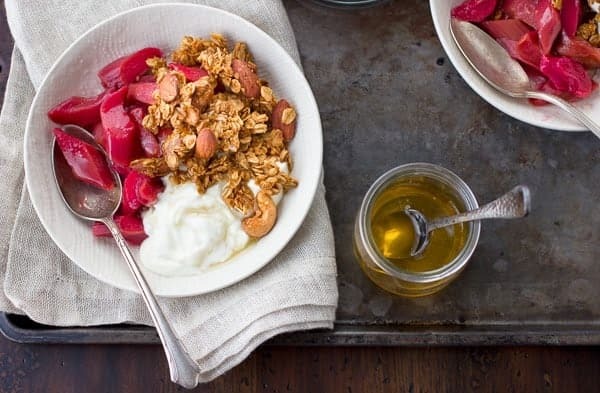 Once you’ve made granola at home, you can never go back. I’ve even been disappointed by the good stuff, purchased from bakeries – it never tastes quite as fresh as homemade. 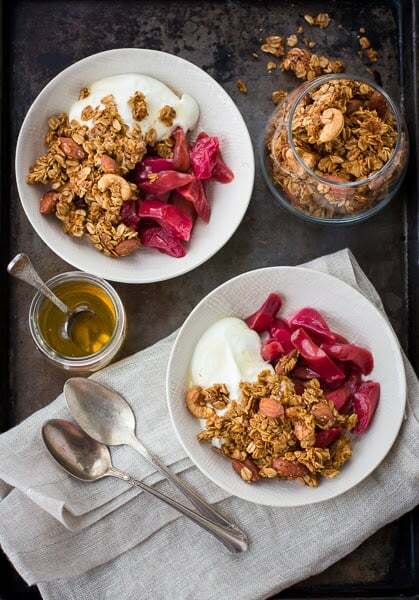 I made a batch of this granola with coconut nectar in place of the maple syrup, not just because it is en vogue, but because I’ve been curious to try it. It worked well, though I found I preferred the robust flavor and crispier texture of the granola made with maple syrup. But the coconut nectar makes quite an adequate substitute if you are so inclined. I often find myself snacking on clusters throughout the day. 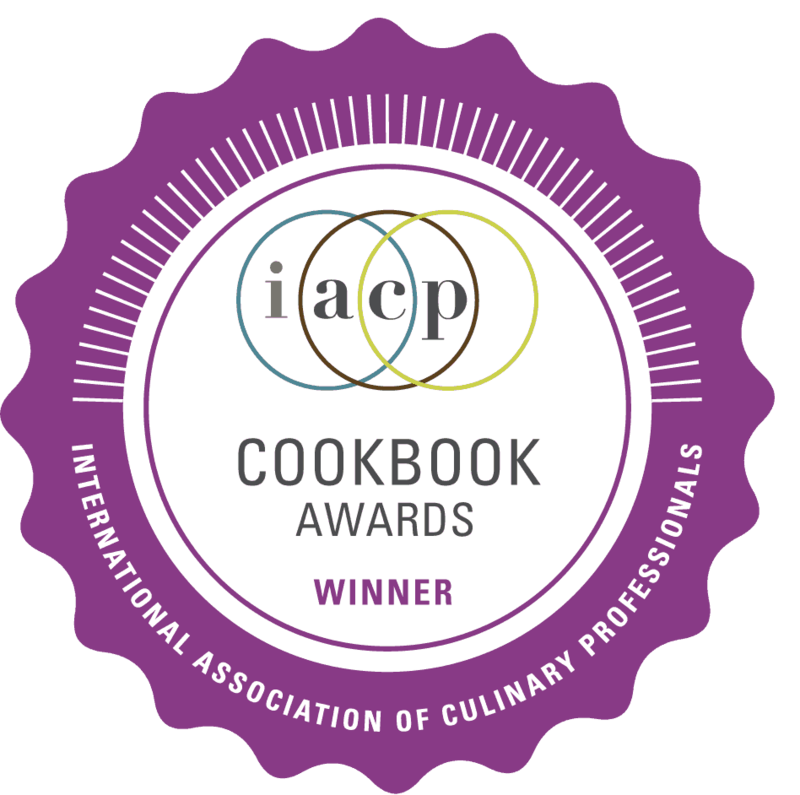 We’ve been particularly enjoying it with honey-poached rhubarb, the by-product of a syrup that I’ve been making for a special cocktail, which I’ll tell you all about in my next post! Hint: it’s made with a type of alcohol that is, I believe, hipper than rum. But I’d have to ask Shawn to be sure. 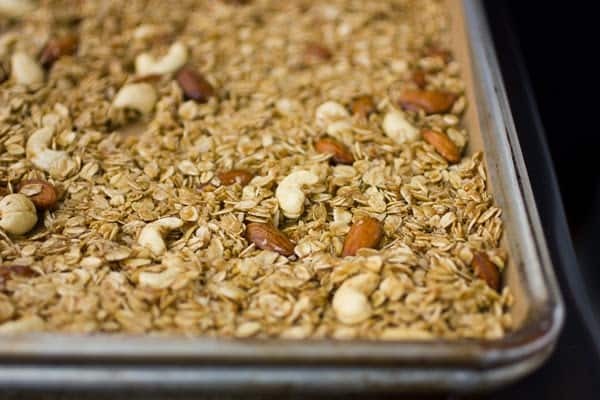 This granola uses a unique baking technique of sandwiching the mixture between two sheet pans lined with parchment paper – no stirring necessary. Leaving it alone means you end up with big shards that can be crumbled into chunks and clumps. 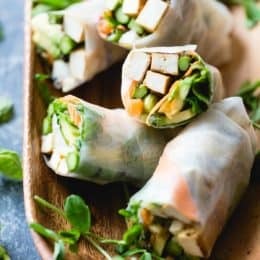 You will need two rimmed baking sheets of the same size, and two sheets of parchment paper. Store the finished granola in an airtight jar at room temperature; it will keep for at least a month. If you can’t find coconut sugar, use 1/3 cup brown sugar or unrefined sugar in its place. I like the spicy, molassesy Kraken rum here, but any dark rum will be lovely, and a gold spiced rum will work, too. If gluten is an issue, be sure to use oats that are certified gluten-free. 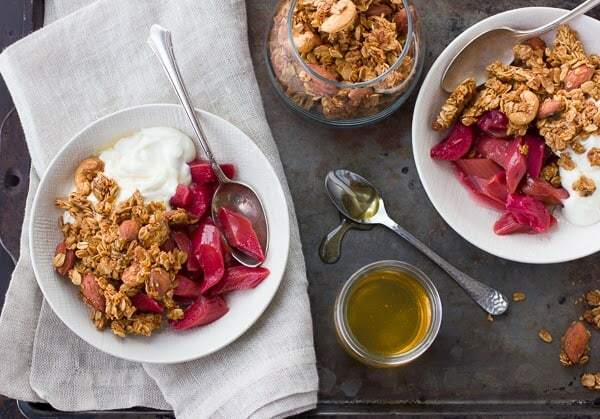 I like this granola sprinkled over a bowl of fresh fruit (berries, mango, apricots and peaches are all great choices) or cooked rhubarb, and topped with a scoop of greek yogurt. Add a drizzle of honey if you want a bit more sweetness. This recipe is extra-easy if you weigh the ingredients into a bowl and pan – no sticky measuring cups! All ounce measurements here are by weight. Position a rack in the center of the oven and preheat to 300ºF. Line a rimmed baking sheet with parchment paper, and have a second rimmed baking sheet and piece of parchment paper at the ready. 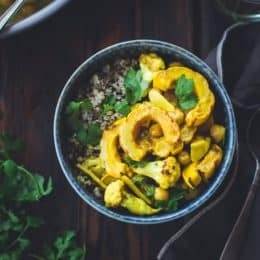 In a large bowl, stir together the oats, cashews, almonds, coconut sugar and shredded coconut. 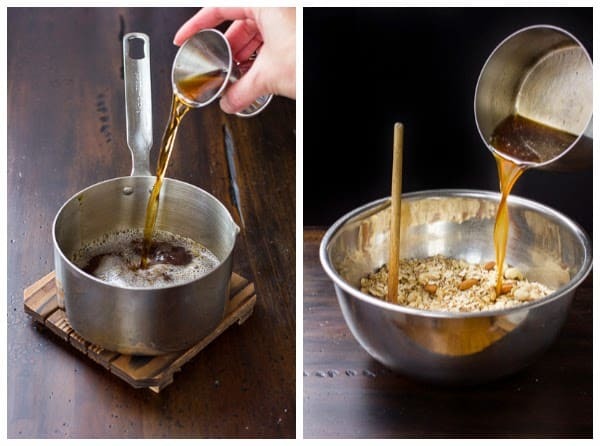 In a small saucepan, combine the coconut oil, maple syrup and salt. Melt over medium heat until the oil is liquified. Stir in the vanilla and rum. Pour this mixture over the oat mixture, making sure to scrape out the salt that likes to stick to the bottom of the pot. Stir the granola well to coat it with the oil and to distribute the salt evenly. Scrape the granola onto the lined baking sheet and spread it into a very even layer with the edges a touch thicker than the center; this will ensure even baking. Top the granola with the other sheet of parchment paper, then the other rimmed baking sheet, right-side-up, making a granola sandwich. Bake the granola until it is deeply golden all over, 35-45 minutes, rotating the pan halfway through. (You’ll need to peek under the parchment to check on it.) It will still be soft, but should crisp up as it cools. Remove the top sheet pan and parchment paper, and let the granola cool completely. If the granola isn’t shatteringly crisp when cool, break it up and return it to a low (200ºF) oven for 10-20 minutes, then cool again and check for crispness. You can also leave it to dry out overnight in a turned-off oven with a pilot light. 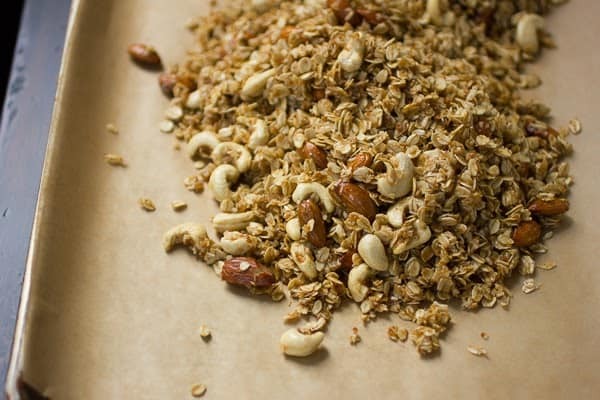 Store the granola in an airtight container at room temperature. It will keep well for at least a month. I love rum! I could not imagine my life without Dark & Stormy's. Are you sure you your friend knows what he is talking about?! Hah. Also, I can't wait to try this new technique with wedging the granola between two baking pans. Sounds so simple! Yeah – hah! Thanks, Shelly. 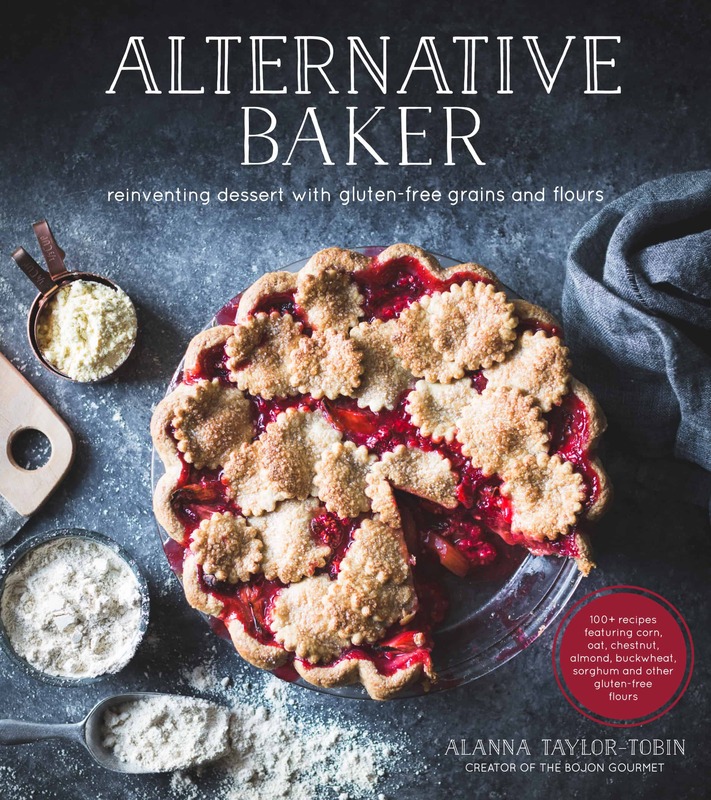 :) I hope you love the granola and its baking technique! 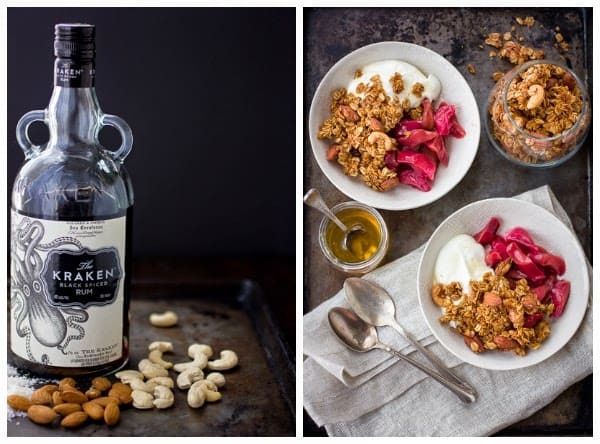 This looks so delicious, I really love the idea of adding rum to granola! I absolutely love your photos too! 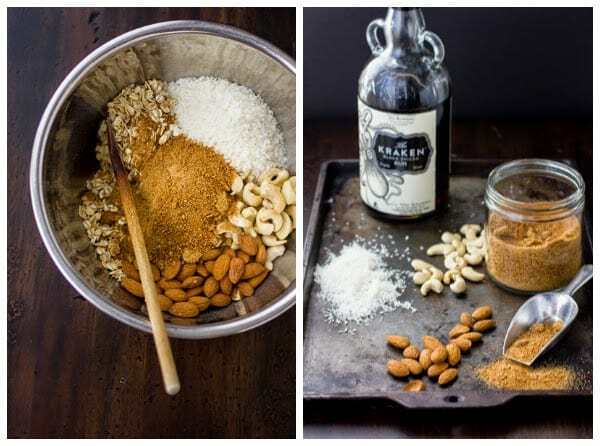 OK, wait, so this was a post about granola and not rum, wasn't it? (: I love the double sheet baking method! 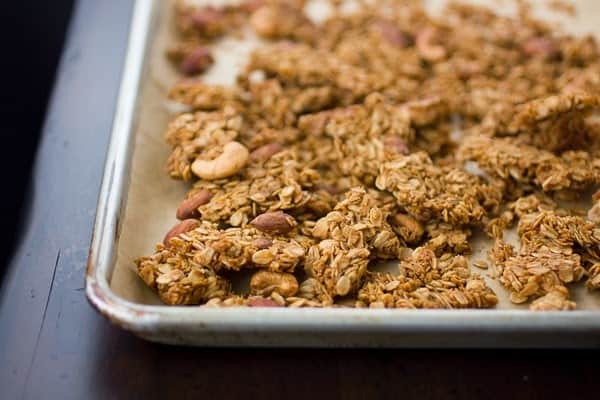 When my mom would bake granola, one of my favorite things to do was to snag the giant chunks off the baking sheet while they were cooling (and she wasn't looking). 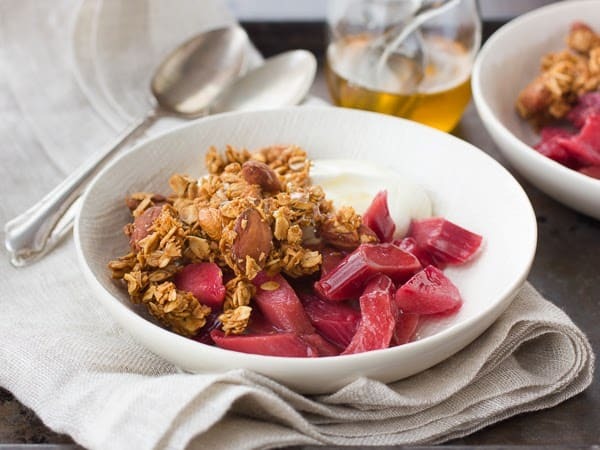 Since I am a savory breakfast gal most days, I am much more inclined to eat granola as a snack than as a breakfast, and chunky bits are perfect for that! OMG, tamarind Dark and Stormy?! Sign me up! That sounds incredible! I agree that rum is misunderstood and needs some lovin'. I've taken to making granola for only myself lately as a once in a while treat – it seems if I deviate from my standby recipe in the slightest, my son will not eat it at all! So weird. But good for me, especially when I find recipes like this! Oooh, thank you for enlightening me! I'm pretty sure Shawn was being completely serious, unfortunately. I mean, he WAS drinking whiskey when he said it. Thanks to your fabulous article, I'm well equipped to deal with naysayers in the future. Thank you!